Product information "Video in motion "Plug & Play" for VW MFD, Audi RNS-D (Navi+)"
Watching moving images during while driving is prohibited by legislation or liability insurance in many countries. In Germany the driver is responsible, without a special prohibition, that his / her sight and hearing are not affected by technical devices. The TV system is intended to allow the passenger and other vehicle occupants the TV and DVD function while driving. The customer has to ensure that unlocked devices do not interfere with the driver's attention. The use is exclusively at your own risk! KUFATEC GmbH & Co. KG is not liable for damages resulting from the unauthorized use. 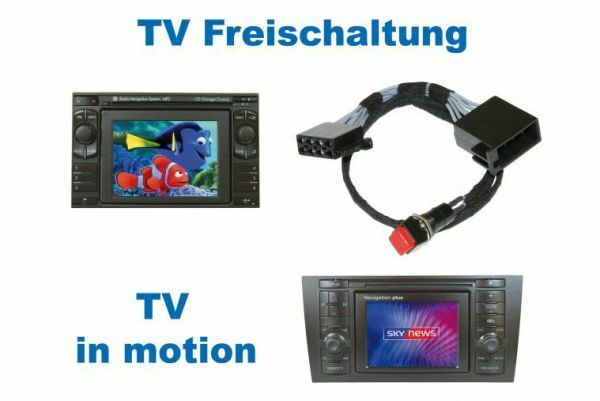 Customer review for "Video in motion "Plug & Play" for VW MFD, Audi RNS-D (Navi+)"
Properties: "Video in motion "Plug & Play" for VW MFD, Audi RNS-D (Navi+)"
Installation manuals for "Video in motion "Plug & Play" for VW MFD, Audi RNS-D (Navi+)"